Comcast will provide Wi-Fi from a truck outside the Democratic National Convention next week. When lots of people gather for concerts or sports events, cellular carriers often bring their networks to the scene with cell towers mounted on trucks, or COWs (cells on wheels). 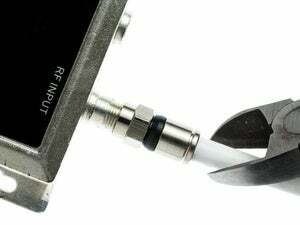 Not to be outdone, Comcast is joining the fray using Wi-Fi. The U.S. cable giant will bring WoW (Wi-Fi on Wheels) to the Democratic National Convention in Philadelphia next week. WoW is what it sounds like: a van with six access points (APs) mounted on a 40-foot mast. Each AP points in a different direction so the truck can deliver strong signals over a wide area. It can serve as many as 3,000 people within a range of 500 feet, according to Comcast. Those users can get speeds as much as five times as fast as cellular, the company says. As internet use grows more mobile, Comcast wants to keep up with rival broadband providers like AT&T and Verizon that have nationwide 4G networks and are moving toward 5G. Its solution has been a broad network of Wi-Fi APs, including many that piggyback off subscribers’ own home Wi-Fi networks. Subscribers to Comcast’s Xfinity broadband and TV services get access to the Wi-Fi network for free, and others can buy hourly, daily, weekly, or monthly passes. WoW is a new service from Comcast. The company has deployed it at the 2016 Wizard World Comic Con in Philadelphia, where it said users got speeds of more than 50G bps (bits per second), and at an arts festival in Connecticut. 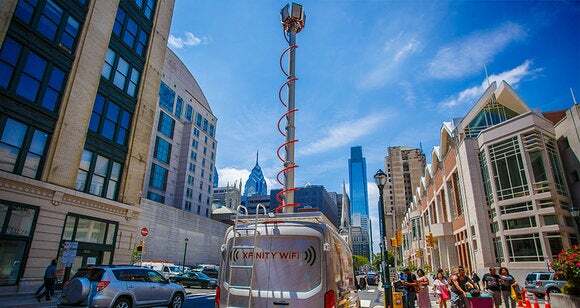 The Democratic convention deployment will be on friendly ground: Philadelphia is Comcast’s hometown, and Comcast is the official broadband and telecom provider for the event. It also provides Wi-Fi inside the Wells Fargo Center arena, where the convention’s main sessions will take place. Comcast Spectacor, a division of the cable company, owns the Wells Fargo Center.